Below are ‘photos of Kileva Eastfield pupils threshing cowpeas harvested from the school farm. The cowpeas will be cooked for lunch in the school feeding programme. Pupil’s are eager to make their school more child-friendly by using a wheelbarrow and spades to remove stones, cowpeas husks, papers, bottles and sharp objects to the disposal pits, thus making the compound safe for pupils. Today we were privileged to host the Sagalla Cluster Ball Games competition. Over 15 schools took part in four disciplines namely : Football,Volleyball, Handball and Netball for both boys and girls. Of the 10 participants from our school, 5 managed to proceed for Divisional Ballgames which will take place on 6/6/2018 at Upper Sagalla. Mdm Priscillah Nguku & Mdm Beata in charge of the School Lunch Feeding Programme. Spectators from Sagalla zone schools today converged at the Kileva Eastfield for ball games. Below you can see Kileva ball games players being served with a special meal to motivate them for their hard work – you see hard work does pay! It was a great fun day indeed for the pupils at Kileva Eastfield primary school. Such a lovely way to end May month. Today (5/6/2018) was World Environment Day. Pupils and teachers participated in making the environment clean and safe to mark this important day in Eastfield Primary school. The learners were given gloves to protect them from germs, bottles and sharp objects. The crops in Kileva Eastfield Primary School have dried up due to shortage of rains. They have not harvested maize. This situation has also been experienced in the villages in Mwakoma. Parents also have not harvested maize crop. 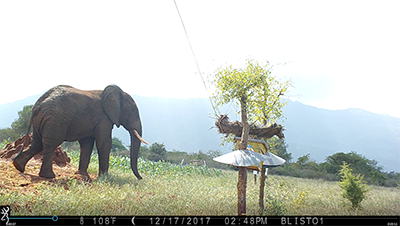 During my time as an intern with the Elephants and Bee Project (EBP) in 2016, I became aware of the fact that honey badger predation of hives often makes the beehive fences less effective. EBP is and has been using metal sheeting on the hive posts to prevent honey badger attacks on hives with some success. Yet, often the honey badger was still able to gain access to the hive. Once on top of the hive honey badgers use claws, teeth and sheer force of will to break through the lid of the hive. This often causes the bees to abscond, leaving the farms vulnerable to elephant crop raiding once again. Therefore, I decided to research economical and non-lethal honey badger deterrents as my Master’s degree thesis project. 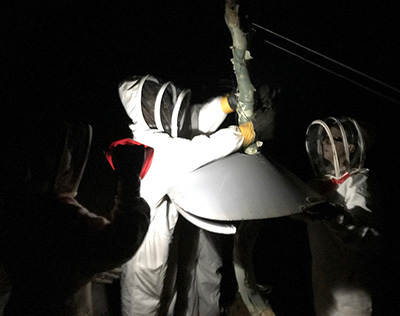 I am testing how the honey badgers of Sagalla Hill react to motion-activated lights as well as hive protection in the form of wire cages for the hives and cones for the posts. I have added these deterrents, one method per hive, to 18 hives and monitor them using camera traps. 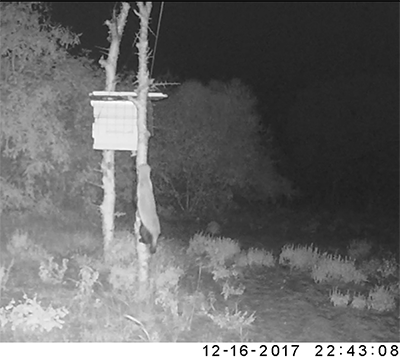 I have been officially collecting data and camera trap footage for just over two months now, during which time my cameras have caught 4 honey badger visitations! Often when I go out into the field I just switch the SD cards and have to wait till I get back to camp to check the footage. Who knew someone’s heart could beat so fast while opening a computer file!? Generally, I get a lot of videos of hares and mongooses, which was cute at first. Yet, those videos lose their appeal when you get a taste of real data producing videos. 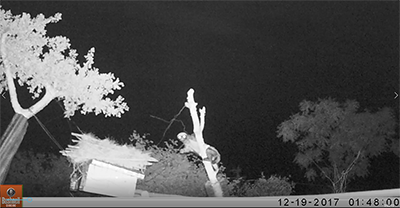 I was in the office after dinner sorting through footage when I came across my first honey badger video. I lost my mind a little bit, cheering the little bugger on from my desk. My yells of “climb, climb, climb” attracted my fellow Elephants and Bees team members, by which time I was out of the office dancing around with my computer. Crowded around my computer we all exclaimed in disbelief when the video cut short just as the honey badger reached the top of the post. 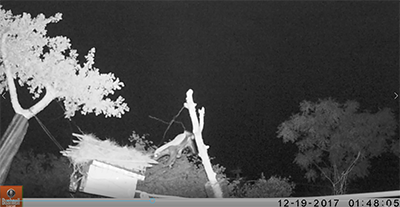 Once I calmed down, I saw that the next video was of the hive violently swinging as the badger walked away, meaning the honey badger must have made contact with the hive. Unfortunately, this behavior was not caught on video because of a delay between videos (this setting has since been changed). If the honey badger was able to make contact with the hive via the post, then why didn’t the hive have any damage? I suspect the wire cage deterrent must have done its job and prevented a honey badger raid on the hive. FIRST WIN OF THE PROJECT! 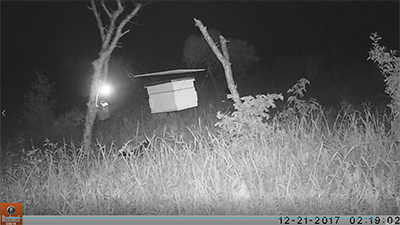 The next video footage of a honey badger came after a farmer, Wabongo, called to say he suspected a honey badger visited his hive. The lid was slightly dislodged and the bees had left. 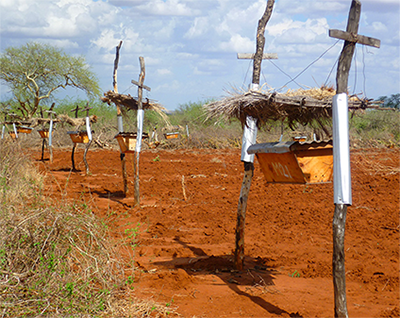 This hive was protected by one of the first cage prototypes, which is shorter than the current design so protects less of the hive. The honey badger spent 50 minutes attempting to gain access to the hive, whereas it only spent two minutes at the previously mentioned hive that had the full cage on it. Perhaps, the honey badger perceived the hive to be more vulnerable, motivating it to continue the raid. This extended raid duration is likely the reason the bees deserted the hive, however, it was a weak/new bee colony. I had to assure Wabongo that although the bees absconded, a stronger colony wouldn’t have left. With some grumbled Swahili, he expressed that he was willing to try the newer cage model on his next hive. I am grateful for the footage and that Wabongo didn’t give up on the project. 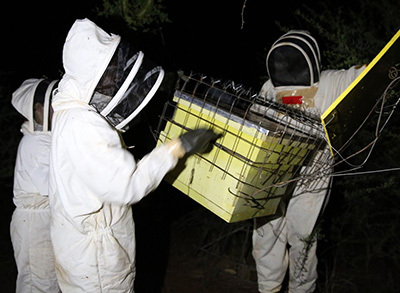 My most recent footage came from hives protected by motion-activated lights! 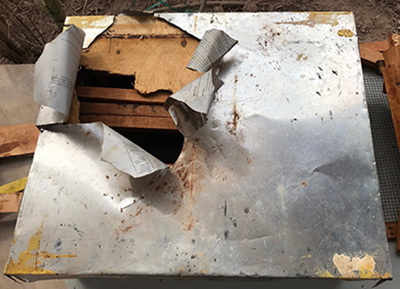 Two hives at the same farm were visited twenty-five minutes apart. 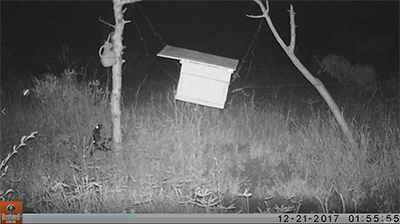 Although I can’t claim it’s the same individual scientifically, I bet it is… And if you assume it is the same individual, the honey badger spent much less time looking at the deterrent at the second hive! Although I am surprised I got these four visitations and the corresponding videos, I am a bit anxious and greedy to get more! I still have not captured any honey badgers visiting the hives protected by cones. So, here’s to hoping for more honey badgers and that the deterrents continue to work! 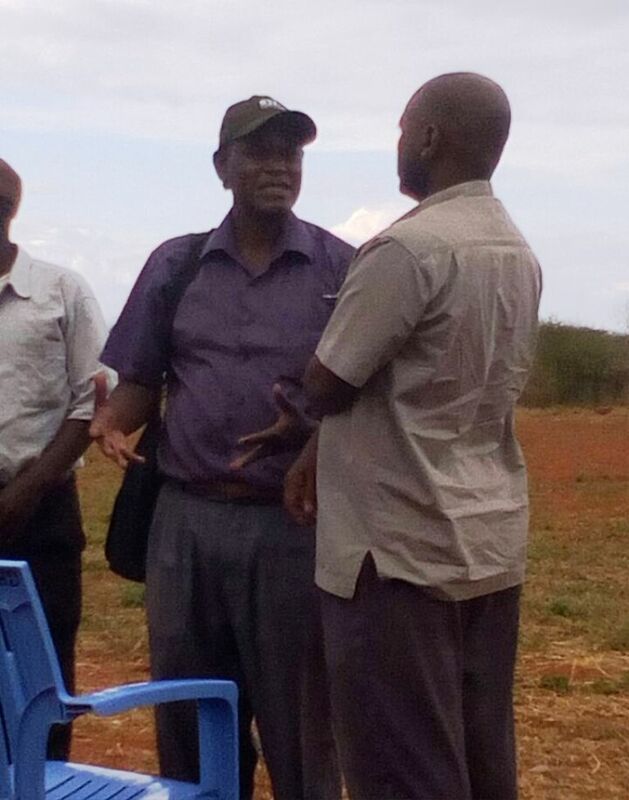 As well as Kileva Eastfield, 12 other schools in the Sagalla region benefited from the recent investment, and in recognition of this the Honourable John Mruyu, Governor of Taita Tavetta County, visited Sagalla to see the work that had been done. With him were Madam Jemimah Tuja, the County Minister for Education who visited the UK in 2014 (click here for details), and the Member of the County Assembly for Sagalla, our very own Kilele. 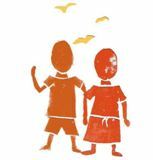 In total, around 1.5 million Kenyan shillings (about £10.4k) were invested in ECDE development, and 3.5 million (£24.3k) in secondary schools. County Education and Libraries Chief Officer Philomena Kirote said the ECDE funds had bought 730 chairs, 200 tables, 68 high density mattress, 16 sufurias and 51 chairs and tables for the teachers. The schools that benefited were Kileva, Kirumbi, Wray, Marie, Talio, Mchanga, Mwambiti, Kajire, Mlondo, Kizumanzi, Kanyanga, Nzae, Sagalla, Mwachoki, Mosi, Sowa and Zungwani.